Laminated front,light shelf wear,vinyl in great shape. Format: Vinyl, LP, Stereo, Album. Records advertised as Sealed or Unplayed should be Mint. The cover and contents suffer from folding, scuffing of edges, spine splits, discoloration, etc. Format: Vinyl, LP, Album, Stereo. Fair: The record is still just playable but has not been cared for properly and displays considerable surface noise; it may even jump. Number of Discs: 1. The cover and contents suffer from folding, scuffing of edges, spine splits, discoloration, etc. Records advertised as Sealed or Unplayed should be Mint. Format: Vinyl, 7", 45 RPM, Single. The cover and contents suffer from folding, scuffing of edges, spine splits, discoloration, etc. Sleeve Condition: Generic. Year : 1978 Cover Condition : Excellent Vinyl Condition : Excellent Genre : Pop UK Release. Condition of Record -EX. Catalogue Number SKL 5078. Format: Vinyl, 7", 45 RPM, Single. Fair: The record is still just playable but has not been cared for properly and displays considerable surface noise; it may even jump. The cover and contents suffer from folding, scuffing of edges, spine splits, discoloration, etc. 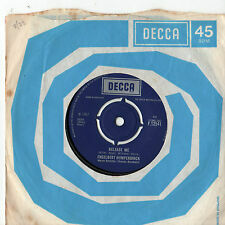 Engelbert Humperdinck Vinyl - Misty blue Record and original sleeve in very good condition. Format: Vinyl, LP, 7". The cover and contents suffer from folding, scuffing of edges, spine splits, discoloration, etc. Records advertised as Sealed or Unplayed should be Mint. POOR: The record will not play properly due to scratches, bad surface noise, etc. The Very Best Of Engelbert Humperdinck - 1976 UK Vinyl LP EXCELLENT CONDITION. Condition is Used. Dispatched with Royal Mail 2nd Class. Year : 1967 Cover Condition : Excellent - Vinyl Condition : Very Good Genre : Pop UK Pressing. Mono. Format: Vinyl, LP, Album, Stereo. POOR: The record will not play properly due to scratches, bad surface noise, etc. Fair: The record is still just playable but has not been cared for properly and displays considerable surface noise; it may even jump. Engelbert Humperdinck - Engelbert. Format: Vinyl, LP, Album, Mono. POOR: The record will not play properly due to scratches, bad surface noise, etc. Fair: The record is still just playable but has not been cared for properly and displays considerable surface noise; it may even jump. Engelbert Humperdinck - Dreaming. Format: Vinyl, LP, Album. POOR: The record will not play properly due to scratches, bad surface noise, etc. Fair: The record is still just playable but has not been cared for properly and displays considerable surface noise; it may even jump. ENGELBERT HUMPERDINCK The Last Waltz - 1967 UK stereo vinyl LP, in a front laminated picture sleeve. The Last Waltz. Record Condition : Excellent. A Place In The Sun. To the Ends Of The Earth. All This World & The Seven Seas. 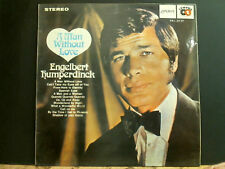 ENGELBERT HUMPERDINCK Engelbert Humperdinck - 1969 UK Vinyl LP,SKL5030. Record Condition : Excellent. I Wish You Love. Winter World Of Love. Let's Kiss Tomorrow Goodbye. The Signs Of Love. ENGELBERT HUMPERDINCK King Of Hearts - 1973 UK vinyl LP, SKL5163. in excellent condition. Songs We Sang Together. That's What It's All About. Only Your Love. Format: Vinyl, LP, Compilation. Records advertised as Sealed or Unplayed should be Mint. The cover and contents suffer from folding, scuffing of edges, spine splits, discoloration, etc. POOR: The record will not play properly due to scratches, bad surface noise, etc. The cover and contents suffer from folding, scuffing of edges, spine splits, discoloration, etc. Format: Vinyl, 7". POOR: The record will not play properly due to scratches, bad surface noise, etc. Records advertised as Sealed or Unplayed should be Mint. Year : 1969 Cover Condition : Very Good Vinyl Condition : Very Good Genre : Pop UK Pressing. Mono. Note: Any records purchased from Life of Vinyl will come with a new polythene cover sleeve and will have been cleaned using a professional vinyl record cleaner. Format: Vinyl, 7". Records advertised as Sealed or Unplayed should be Mint. The cover and contents suffer from folding, scuffing of edges, spine splits, discoloration, etc. POOR: The record will not play properly due to scratches, bad surface noise, etc. Format: Vinyl, LP, Album, Mono. POOR: The record will not play properly due to scratches, bad surface noise, etc. Records advertised as Sealed or Unplayed should be Mint. The cover and contents suffer from folding, scuffing of edges, spine splits, discoloration, etc. This is a fabulous album, which captures Engelbert at his brilliant best. Condition of Record -EX . Condition Of Sleeve - EX. Format: Vinyl, 7", Single, 45 RPM. NO PICTURE SLEEVE, GENERIC SLEEVE ONLY: Vinyl in great shape. POOR: The record will not play properly due to scratches, bad surface noise, etc. Fair: The record is still just playable but has not been cared for properly and displays considerable surface noise; it may even jump. Engelbert Humperdinck - Sweetheart. Format: Vinyl, LP, Album. POOR: The record will not play properly due to scratches, bad surface noise, etc. Fair: The record is still just playable but has not been cared for properly and displays considerable surface noise; it may even jump. FOR CONDITION OF COVER SEE PICTURE. Format: Vinyl, LP, Album. POOR: The record will not play properly due to scratches, bad surface noise, etc. Fair: The record is still just playable but has not been cared for properly and displays considerable surface noise; it may even jump. ENGELBERT HUMPERDINCK - Engelbert Humperdinck. This is one of 10000 LP's, 12” and 7" that I HAVE COLLECTED OVER THE LAST 30 YEARS; they run from the 1950's to the 2000's and cover every style of music. Engelbert Humperdinck The Very Best Of double LP . Condition is Used. Dispatched with Royal Mail 1st Class. Year : 1978 Cover Condition : Very Good Vinyl Condition : Excellent - Genre : Pop South African Release. (a couple of very small tears to opening edge of sleeve otherwise Very Good ). M (Mint),EX (Excellent),VG (Very Good),G (Good),F (Fair),B (Bad). The cover and the contents suffer from folding, scuffing of edges, spine splits, discoloration, etc. The first refers to the disc and the second to the sleeve. Format: Vinyl, 7", 45 RPM, Single. Records advertised as Sealed or Unplayed should be Mint. The cover and contents suffer from folding, scuffing of edges, spine splits, discoloration, etc. POOR: The record will not play properly due to scratches, bad surface noise, etc. (Mint condition) This is the highest grade for records that have been played. All vinyl records are carefully and thoroughly graded by one of specialists. All recordings are visually inspected under high-intensity lights, using our own grading system which is highlighted below. Pre-loved vinyl LP in VG condition. Does not affect sound quality or play. Tested on Audio Technica AT-LP5 turntable, plays perfectly. Cleaned using Pro-Ject VCS vacuum cleaner. Sleeve also in VG condition. The cover and contents suffer from folding, scuffing of edges, spine splits, discoloration, etc. Fair: The record is still just playable but has not been cared for properly and displays considerable surface noise; it may even jump.